Report of H.L. Strickler, Commissioner to Audit Claims of Citizens of the Territory of Kansas, contained in the U.S. Congressional Serial Set of congressional and executive documents. 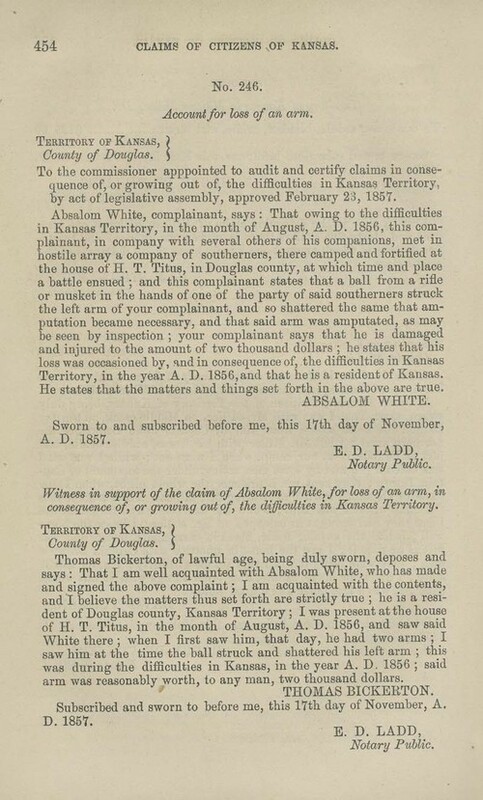 Absalom White filed claim #246 for the loss of an arm as a result of being struck by a bullet at a battle with southerners near the H. T. Titus [probably Henry C.] home in Douglas County. The arm was subsequently amputated. The claim was not allowed on the grounds that White was "engaged in rebellion and making unwarranted attack on the person and property of a private citizen." Each claimant had to submit an itemized list and have two witnesses attest to the losses claimed. Even though many of these claims were approved for payment, no funds were ever appropriated or distributed.